You can replace the coverage table of any given insurance plan with a copy of the coverage table from any other plan. You can use the replacement coverage table as is or make changes as needed to create a coverage table based on another. Modifying the duplicate coverage table does not change the originating plan's coverage table. You can also replace a plan's coverage table with a copy of one of the coverage table templates and then modify it as needed for that plan. Important: Changing an insurance plan's coverage table affects all patients covered by that insurance plan. 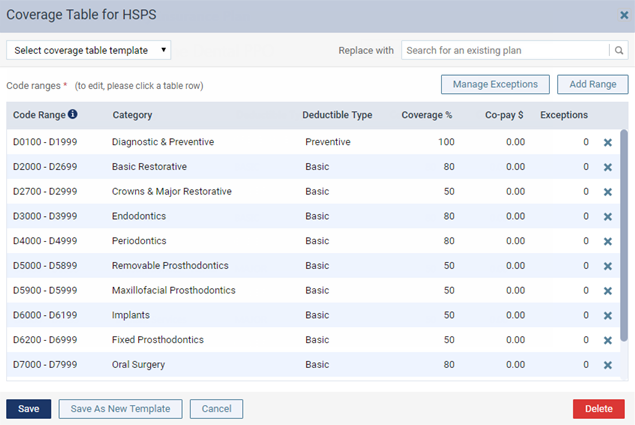 From the Select coverage table template list, select a coverage table template on which to base or to use as is for the insurance plan's coverage table. 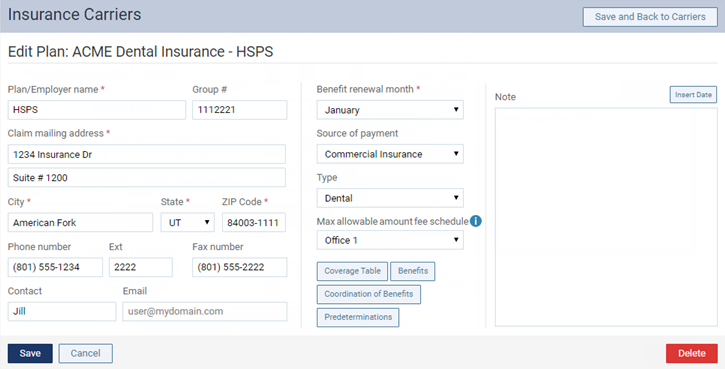 In the Replace with search box, begin typing the carrier name, group plan or employer name, or group number of the insurance plan that has the coverage table that you want to copy to the current insurance plan. Continue typing as needed to narrow the results list. Then, select the desired plan. The coverage ranges for this insurance plan's coverage table are replaced with a copy of the ranges from the selected coverage table template or from the selected plan's coverage table. Tip: At any time before you click Save, you can revert back to this insurance plan's coverage table from before a replacement was selected by searching for and selecting this insurance plan from the Search for an existing plan search box. Alternatively, you can click Cancel to close the dialog box and not save the change. Add, edit, and delete the procedure code ranges as needed. Click (or tap) Add Range to add a procedure code range, or select an existing range to edit that range. Code Range - The ADA or custom procedure code range. These fields accept dashes (-), periods (. ), numbers, and letters, and they can be up to 10 characters in length. Make sure there are not any overlaps and gaps in the sequence between the starting and ending codes in the range and between other ranges. Note: When you change a range and then click (or tap) somewhere else, the text of the range that you modified turns bold. Also, any ranges that overlap or that are invalid become highlighted in red, and you cannot save the changes to the coverage table until those errors are resolved. Category - The procedure category for the procedures in the range. Deductible Type - The type of deductible that the procedures in the range apply to. Coverage % - The percent that the insurance carrier pays on covered charges (after any deductible, up to any allowed amount, and up to any maximum allowed benefit) for procedures in the range. Co-pay $ - The patient co-pay for capitation plans. Patients will pay the specified amount for the procedure (do not use more than one procedure in a range when working with the coverage table for a capitation plan). Repeat the steps a - b for any other ranges that you want to add or edit. To delete a range, click (or tap) that range's Remove button , and then click (or tap) Delete on the confirmation message that appears. Important: If you are deleting the only range in the coverage table, the entire table will be deleted. To add, edit, or delete exceptions to the coverage for specific procedures, click (or tap) Manage Exceptions. To apply the changes to the coverage table and create a new coverage table template using the specified coverage options, click (or tap) Save As New Template. In the New Coverage Table Template dialog box that appears, type a name for the template, and then click (or tap) Save. To apply the changes to the coverage table, click (or tap) Save.